Pin Oaks Stables’ Synchrony has done no wrong in his three career starts over the Stall-Wilson Turf Course and will look to make it 4-for-4 in Saturday’s Grade 3, $150,000 Fair Grounds Handicap run on the Risen Star Stakes (G2) undercard. The Mike Stidham-trained son of Tapit was a two-length winner of last year’s edition of the Fair Grounds Handicap, which he followed up with a triumph in the Grade 2 Muniz Memorial Stakes. 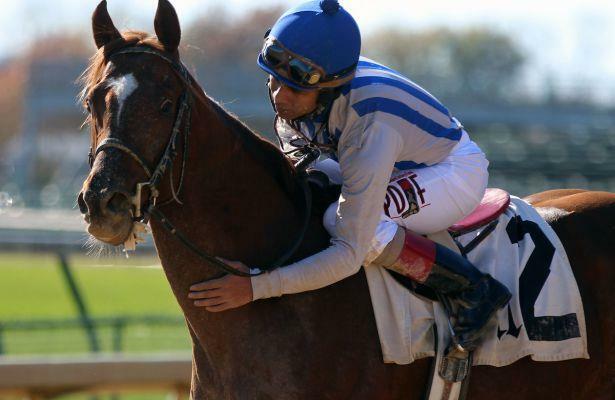 Since then, he has recorded two Grade 3 wins over the turf at Monmouth Park in the Red Bank Stakes and Oceanport Stakes. Synchrony has not raced since a troubled third in the Grade 2 Seabiscuit Handicap at Del Mar on November 24. However, he is the 3-1 favorite for the mile-and-an-eighth event and will be guided by jockey Joe Bravo. Back for redemption after finishing third in last year’s Fair Grounds Handicap behind Synchrony is Chiefswood Stable’s Tiz a Slam, who has not raced since a fourth-place finish in the Grade 1 Canadian International stakes at Woodbine. Trained by Hall of Fame trainer Roger Attfield, the Ontario-bred son of Tiznow collected two back-to-back graded stakes wins at Woodbine last summer when taking the Grade 3 Dominion Day Stakes over the all-weather surface and the Grade 2 Nijinsky Stakes over the Toronto lawn. A win in the Fair Grounds Handicap would give Tiz a Slam his first victory outside of Woodbine. He will break from the rail under jockey Corey Lanerie at 8-1 morning line odds. Fresh off a win in the Colonel E.R. Bradley Handicap last month is Team Valor’s First Premio, who won the event off of a seven-month layoff. The Mark Casse-trained son of Pure Prize won his first stakes race last time out and will attempt his first score at graded stakes caliber. "Hopefully he doesn’t regress from that," Casse said. "That would be my biggest concern there. I think if things were to go well with him and we could get him into a nice race pattern and keep him healthy he could be one of the better turf horses around this year." He will break from post six under jockey Brian Hernandez, Jr. as the 4-1 morning line second-choice. Sir Dudley Digges (post two, Tyler Gaffalione, 10-1), Sun Lover (GB) (post three, Jack Gilligan, 30-1), Long On Luck (post four, Gabriel Saez, 30-1), Big Changes (post five, Florent Geroux, 6-1), Combatant (post seven, Jose Ortiz, 8-1), Markitoff (post eight, Manny Franco, 12-1), Great Wide Open (Ire.) (post ten, James Graham, 9-2), and Bandua (post 11, Adam Beschizza, 15-1) complete the field. The Fair Grounds Handicap will go off as the 10th race on Louisiana Derby Preview Day and has a scheduled post time of 4:57 p.m. ET. It is also the second leg of a $200,000 guaranteed all-stakes Pick 4.